Commission in 122 combat Support Course (SPSSC) at Pakistan Air Force (PAF) in Abbottabad, Dera Ismail Khan, Faisalabad, Hyderabad, Islamabad, Karachi, Lahore, Multan, Peshawar, Quetta, Rawalpindi, and Sukkur Cities. Pakistan Air Force is a Government Organization which requires employees for Medical Jobs in cities Abbottabad, Dera Ismail Khan, Faisalabad, Hyderabad, Islamabad, Karachi, Lahore, Multan, Peshawar, Quetta, Rawalpindi, and Sukkur. 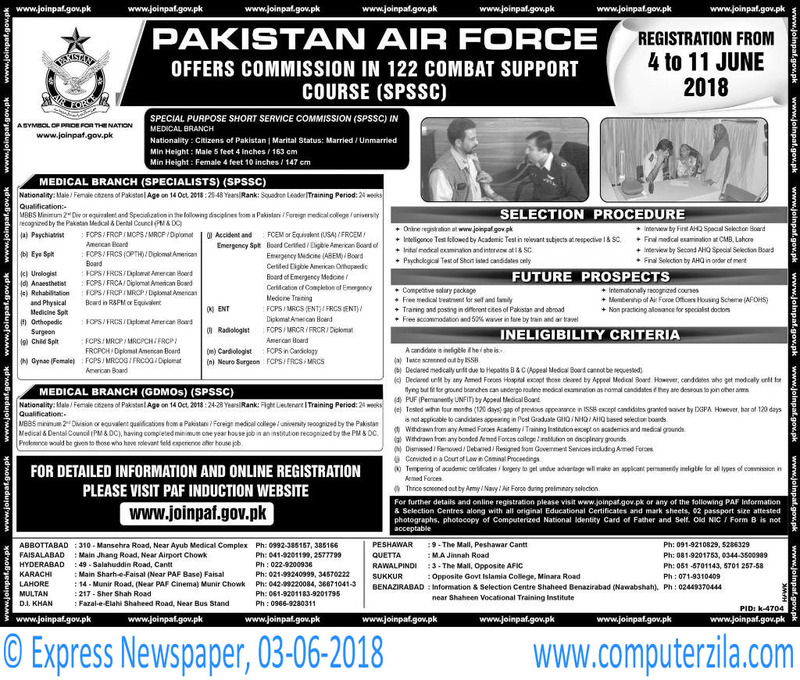 Pakistan Air Force Offers Commission in 122 Combat Support Special Purpose Short Service Commission (SPSSC) in Medical Branch. Psychiatrist, Eye Specialist, Urologist, Anesthetist, Rehabilitation and Physical Medicine Specialist, Orthopedic Surgeon, Child Specialist, Gynae (Female), Accident and Emergency Specialist, ENT, Radiologist, Cardiologist and Neuro Surgeon.